Access to a specialized imaging device that measures reflectance was awarded to two doctoral students at Rochester Institute of Technology in support of their thesis research. 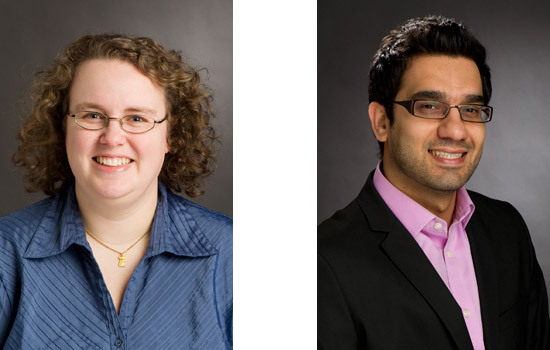 Kelly Canham and Nima Pahlevan, students in the Digital Imaging and Remote Sensing Laboratory in the Chester F. Carlson Center for Imaging Science, won temporary use of spectralradiometers. These instruments measure the amount of light reflected from a material at each wavelength along the electromagnetic spectrum. The awards were made through the Alexander Goetz Instrument Program, co-sponsored by Analytical Space Devices Inc. and the Institute of Electrical and Electronics Engineers Geoscience and Remote Sensing Society. A total of seven 2011 award winners were named. Canham, a resident of Palmyra, Mo., shares her award with David Messinger, director of the Digital Imaging and Remote Sensing Laboratory, and William Middleton, associate professor of sociology and anthropology. They are developing image-processing tools that will aid Middleton’s archeological research pertaining to the Zapotec civilization in Oaxaca, Mexico. In December, Canham will use the spectralradiometer, a Field Spec Pro, in Oaxaca to measure the amount of light reflected from soils and vegetation common to the area. The library of spectral signatures—not images—she builds will help the archeological team decide where to dig. Distinct spectral signatures or “fingerprints” will help Canham distinguish between different vegetation and minerals in the soil in Oaxaca. The team will compare the spectra to images processed in an earlier stage of the project using data collected by NASA’s Earth Observing 1 satellite and its Hyperion hyperspectral sensor. Hyperspectral imaging combines bands of spectral information from the electromagnetic wavelength into three-dimensional data cubes. Pahlevan, a resident of Tehran, Iran, and John Schott, the Fredrick and Anna B. Weidman Professor in the Center for Imaging Science, also won temporary access to a spectralradiometer through the Alexander Goetz Instrument Program. Pahlevan and Schott will use the hand-held device in July to analyze optical properties of coastal waters. “We will investigate the water quality of the southern shores of Lake Ontario at the mouth of the Genesee and the Niagara rivers,” Pahlevan says. Their research will also examine the potential of a new generation of the Earth-observing satellite sensor, Landsat, scheduled for launch in December 2012. “This effort introduces a different approach, based on satellite remote sensing, to provide environmentalists and decision makers with better insights on the state of the ecosystem in coastal waters on a regular basis,” Pahlevan says.